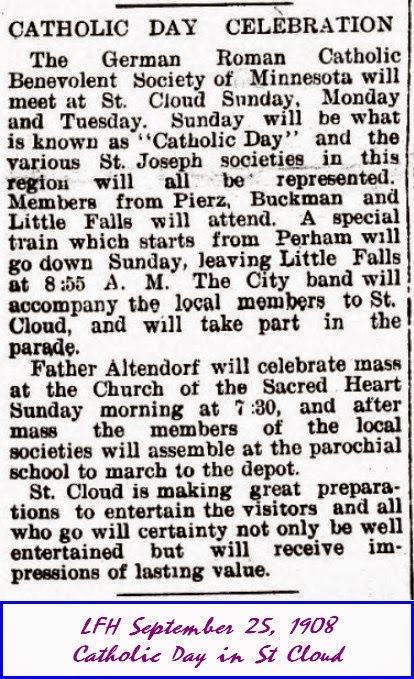 I'm sure you remember a post from December, 2012, about the massive confirmation celebration in Pierz in the fall of 1910. We were aware of it because a postcard Larry found of St Joseph's church had an arch and banner in front and horses (and a parade with brass bands and a dozen neighborhood priests in attendance). 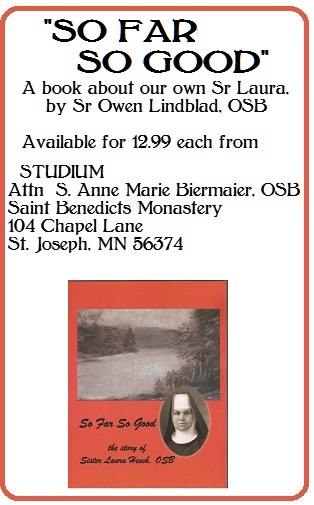 The German Roman Catholic Benevolent Society of Minnesota will meet at St Cloud Sunday, Monday and Tuesday. 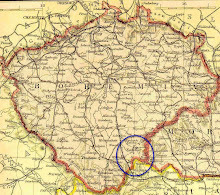 Sunday will be what is known as "Catholic Day" and the various St Joseph societies in this region will be represented. Members from Pierz, Buckman and Little Falls will attend. A special train which starts from Perham will go down Sunday leaving Little Falls at 8:55 AM. The city band will accompany the local members to St Cloud and will take part in the parade. Father Altendorf will celebrate mass at the church of the Sacred Heart Sunday morning at 7:30 and after mass the members of the local societies will assemble at the parochial school to march to the depot. St Cloud is making great preparations to entertain the visitors and all who go will certainly not only be well entertained but will receive impressions of lasting value." 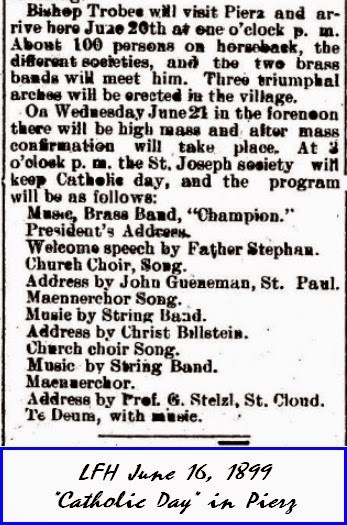 "Bishop Trobec will visit Pierz and arrive here June 20th at one o'clock PM. About 100 persons on horseback, the different societies and the two brass bands will meet him. Three triumphal arches will be erected in the village. Welcome speech by Father Stephan. Address by John Gueneman, St Paul. Mannerchor. Address by Prof. G. Stelzl, St Cloud.